2016 has been a terrifyingly surreal political rollercoaster. Brexit brought chaos to the UK, Australia’s seemingly endless rotation of political leaders continues, and now, Donald Trump is the President of the United States. And that’s just three countries. Politics and music constantly intertwine, with countless songs, albums and entire genres rising from the flames that sociopolitical unrest inspires. If anything – if there’s one single positive thing that comes from tragedy and political upheaval – it’s the historically inevitable flurry of art. In 2016 alone, we have seen politically motivated music from Beyoncé, Solange, Common, Radiohead, Squarepusher, ANOHNI, A.B. Original, Jay Z, Kendrick Lamar, Run The Jewels, Eminem and many, many more. Be it visual arts, theatre, music or literature, the art world reacts to political chaos, racial injustice and social disarray with creative ferocity, often producing art imbued with a sense of urgency, even aggression, in its intent and necessity. I thought to use this week’s Flashback Friday to reflect on some of the many, many anti-Donald Trump songs out there, but there’s enough Trump discourse circulating right now, so I have instead chosen to focus on a less specific, but eternally affecting political album. I’ve chosen this album not only for my personal connection to it, but as an example of how a record can both be so beautifully crafted out of the raw, vile carcass that is global politics and society, and how it can retain and exude relevance and vitality by having a message, having purpose. 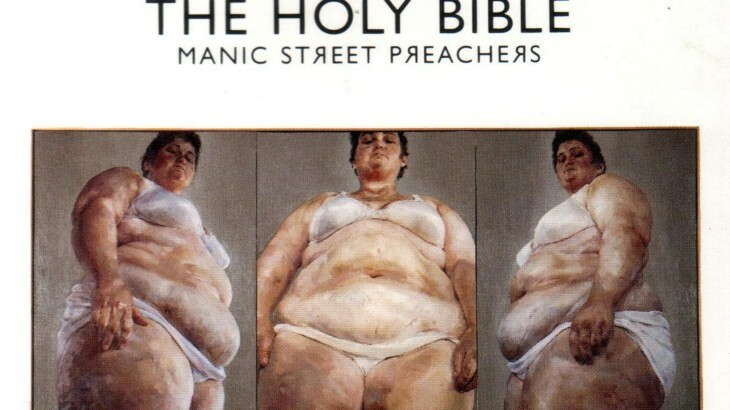 The album I would like to talk about today is The Holy Bible by the Manic Street Preachers. 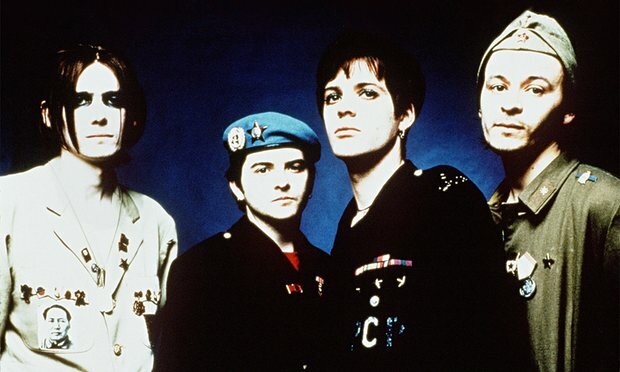 The history of Manic Street Preachers is as interesting as any; the Welsh four-piece formed in 1986 and quickly developed a loyal cult following as their albums grew more punky and more conscious, sometimes painfully so. The group delivered songs about a massive range of issues from global capitalism and American consumerism to mental illness and drug abuse, from dictatorships and serial killers to the Holocaust, abortion and suicide. 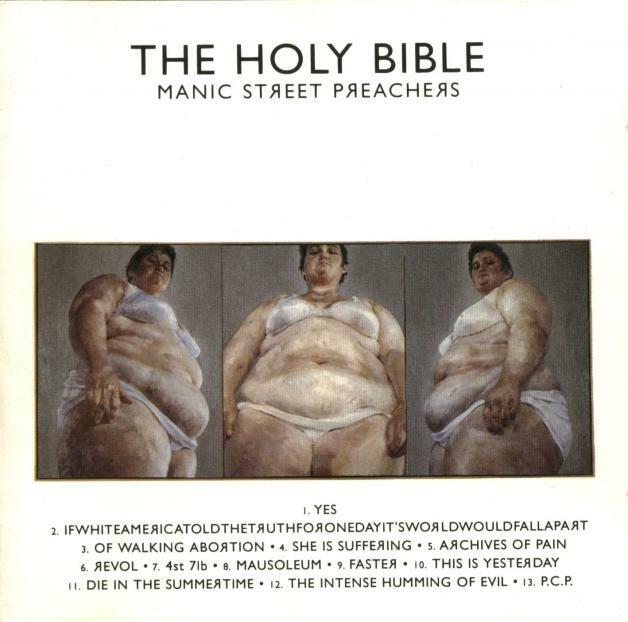 The Holy Bible is their third album, released around six months before the now-mythological event that was the disappearance of lyricist and guitarist Richey Edwards, who was never found, and only declared presumably dead in 2008, 13 years later. The troubled Edwards had a reputation for being volatile. By the time The Holy Bible came out, he was juggling drug addiction, alcoholism, anorexia nervosa, and several related mental health concerns including self-harm. Yet his musical and lyrical talent – nay, genius – persisted. Of this album, Edwards reportedly coined around 75% of the lyrics; the rest were composed by bassist Nicky Wire. The record is so detailed, relentless, and unfalteringly aware of so, so, so many socio-political issues, almost to a fault; the lyrics are often more difficult to digest than the fastest rap verses in hip-hop history. My personal favourite song on the album, and the most relevant to today, is track 2: IfWhiteAmericaToldTheTruthForOneDayIt’sWorldWouldFallApart. The song is a burly uppercut to the jaw of American consumerism and privilege. Its standing relevance alone is of note; this song could have been released a week ago, and would sound as vital. It’s also the best example of how much information the Manics managed to smash into a single song; this album taught me more about politics than any other record or even school class at the time. I first heard this album when I was 15 or 16 years old without understanding nearly any of those references – and that’s just one part of one song. I looked through the album sleeve (yes, young folks, I owned – still own – this on an actual CD) and read through all the lyrics. Suddenly, this wildly dramatic alt-punk album became a textbook. I would research every lyrical reference on the album that I didn’t understand. It was the greatest global society and politics lesson I’ve ever had. Still, the album extended far beyond politics. It captured the pulse of not one, but around thirteen devastating and dark aspects of humanity and society, and turned it into an album that has had a remarkably deep impact on my perception of these issues. As such, it is excellent proof of good art coming from bad humanity. How many of those references can you pick? They are a collection of violent politicians, torturers, serial killers, rapists and dictators. Learning about the origins of this song was a dark day for 16-year-old me. 4st 7lb is one of the most heartbreaking songs on the album and indeed their whole career. It’s about anorexia. The title refers to the weight (29 kg) of no return; the point of such severe malnutrition that the sufferer will inevitably die. That Edwards was living with anorexia at the time makes this all the more powerful, although he disguises himself on the song, assuming the persona of a teenage girl – the most common demographic. She proudly presents or unending, fatal obsession, feebly marching toward her death. Some say that it glorifies anorexia, I disagree. Rather, it provides a very real insight into how it feels from the perspective of someone living with an eating disorder. This is one of many assumed characters throughout this album, but she is the most obvious. The final track I will mention is The Intense Humming of Evil. As you can likely judge by the title, it is a beastly composition, centred on the horrors of the Holocaust and Hitler’s concentration camps. The song begins with a lengthy sample of a quote read out during the Nuremberg trials (if you haven’t heard the album, look up all the samples too – nearly every track opens with one.) The verses and chorus are then characterised by two personas, one of a prisoner, and one of a Nazi soldier. Some music has the ability to affect, commentate and remain relevant for with tremendous longevity. This album taught me so much. It’s different to, say, To Pimp A Butterfly, which takes the listener through Kendrick Lamar’s own struggles with injustice and racism; of course the Manics were not involved in all of the topics on the album. But in some ways, to a 15-year-old me anyway, that made this knowledge and these opinions even more accessible; I didn’t feel disconnected to the artist, I felt educated by them. I didn’t have to have lived through it to understand why it was so destructive. It was simply an onslaught of hyper-aware information – much of which is as pertinent to this very week as it did back in 1994. Music has the power to simultaneously provide insight into, and solace from, the world’s terrors. At the time of writing this, it’s about 24 hours after Donald Trump has been elected to be President of the United States. It’s difficult to conjure hope or faith, but one thing I can do is turn to the artists and musicians who have the power to grasp devastating events and use them to create something important and beautiful, whether a response or reflection. The Holy Bible had a huge impact on my understanding of the world, and I have no doubt that the next four years will, if nothing else, produce many more records that are just as sobering, insightful, and important as this one. Flashback Friday Manic Street Preachers. permalink.